With India continuing to face severe pressure on its water resources, a new WWF report published outlines the increasing water risks for businesses that could lead to significant losses for the country’s banks. 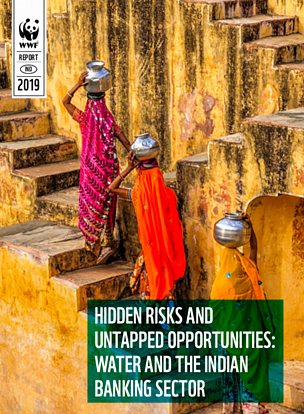 Launched with the Indian Banks’ Association (IBA), ‘Hidden Risks and Untapped Opportunities: Water and the Indian Banking Sector’ provides evidence for why water presents a material risk for banks in India. In particular, it shows how water risks could lead to stranded assets in the power and agriculture sectors – two sectors that account for the highest gross credit exposure of Indian banks. The report reveals that close to 40% of the gross credit exposure of Indian banks is in sectors where water risks are significant. Reeling under a crisis of non-performing loans with close to 10% of gross-advances of the Indian banks facing a risk of non-payment from debtors, these risks can place further liquidity constraints on the already stressed balance sheets of banks in India. According to NITI Aayog, the current water crisis in the country is its ‘worst ever’. With water being a shared resource, what the country requires is a comprehensive and sustainable water management plan by various stakeholders. While banks are exposed to the risks of water as lenders to businesses, it also places them in a unique position to influence businesses to proactively handle various water related risks, including using WWF’s Water Risk Filter and enabling flow of capital towards solutions, which address such risks.